The most exciting beauty pageant has come again. There seems truly nothing better and bigger than Bb Pilipinas pageant. For me who have been following the pageant since I was a kid, the pageant’s become more exciting every year. This has been evident in the turn out of people going to the pageant’s events such as the fashion show, talent showdown, parade of beauties, and ultimately during finals night. Here are the top charmers during the parade of beauties where we saw the ladies up close and personal. This list in fact validates my thoughts of them before the parade. I have a collection of pageant materials and I do still enjoy back tracking pageants in my iPad before I fall to sleep. I watch Bb Pilipinas or Miss Universe when I wake up as I prepare to work. I have been organizing viewing parties for Miss Universe. I have gained a group of close friends who are beauty pageant enthusiasts as well. These are some of the activities that expose me to the pageant culture not to mention that I used to mentor pageant contenders in pasarela, styling and interview. Do you see the potential queens in the collage below? This year’s more exciting because there’s a need for us to seriously revisit our choices surveying the trend of the recent international winners and what seems to be the kind of look or personality the international pageants are seeking for. Such will give our country higher propensity of clinching more international crowns. 2014 was not exactly a great year for Bb Pilipinas as we know. Drilling further, in international pageants there has to be a profile of that winning package per pageant. It should not mean sending just anyone. Miss Intercontinental is looking for strong stage presence, commercial appeal, striking facial features, and runway power. Here are the Top 4 profiled for this pageant. Miss Tourism is looking for a statuesque winner who is lovely, fierce, facially very attractive and modelesque. So she has to possess these qualities. Here are those to my judgement profiled for MTQI. Miss Supranational is looking for the fun, very likable type of winner who has very strong stage power. To choose a winner for this pageant, look into facial beauty that is cosmopolitanly striking, with superb runway power that can draw needed attention and fun personality. Here are those who can be perfect for this pageant. Miss International is looking for an elegant, regal, facially gorgeous, strong appeal and that reserve queenly type. There’s no need for much eloquence here as it has been that speeches said during the finals are pre-prepared. Miss Universe is the best for me because its standard to quite an extent has become predictable. The choosing has to be someone who is holistically likelable. Recent trending has it that Miss Universe chooses the most striking on stage (modeling background a true plus), she who is commercially appealing (power power to attack sponsors), she who has fun and amiable personality, she who has a huge fan base making noise for the pageant to stay relevant, she who is statuesque and could be runway, she who could speak confidently on TV and do big events, etc. Thus, from amongst the candidates this year, the following have what it takes to become the next Miss Universe from this pageant amorous nation. As here have been alternatives given above, if I can judge it my way here are my final choices. I go for Hannah Sison to clinch the plum Miss Universe Philipines crown as she is or almost ready in all aspects. It would no longer need a lot of push or effort to find “it” or make her confident as she already is . She speaks excellently given her educative endeavor. While Experience is a plus but it’s truly her winning package that has made her stand out. Hannah is statuesque, has huge fan base, is confidet and is smart. Many even from her very first attempt in 2013 believe that she should have been crowned. Methinks anything can happen come sunday and that makes the pageant more exciting. Good luck to all the candidates this year. May you all shine and may you get what you truly deserve! Are you ready for the next Miss World Philippines? Would certainly like to see all of them in person but so far I see the real competition head to head between Valerie Weismann versus Rachel Louise Petersn this year’s Miss World Philippines quest. Valerie Weigmann, 5’9″, Filipina-German, the sole entry of beauty pageant camp Aces & Queens in this year’s search is a model and celebrity host of famous TV noontime show Eat Bulaga. Will Rachel and Val be the last two standing in this year? That is something to excitedly look forward to. In the meantime, here’s the list of official candidates to date. There’s yet another extended screening scheduled this Friday, September 12, 2014. Miss World Philippines coronation night this year will be on October 12, Sunday at the Mall of Asia Arena. Yes, many say the Philippines’ strongest bet in Miss Universe is recent date is finally competing in this year’s much awaited quest. Welcome, Miss Universe Philippines Mary Jean Lastimosa, 26, from the province of North Cotabato. We all know MJ’s story of perseverance, determination, passion for pageants, huge fan base, etc. The four-peat top five finish of this pageant loving Philippines since 2010 has truly placed this country in Miss Universe pageant success book having the most amazing fan base and support, having such competitive and likable delegates trending so well in Miss Universe pageant, amongsts the huge pageant fanatics world over, etc. MJ’S 3rd entry to Bb Pilipinas clinching the plum Miss Universe Philippines crown was such a huge success story. Now, there’s just nothing that shall stop her to go to the Miss Universe pageant. This is certainly going to be the most awaited pageant this year. Will Mary Jean Lastimosa be the 3rd Filipina Miss Universe? Let us see. Been praying and wishing for a Miss Universe crown in this lifetime. While the pageant venue and date have not been officially announced just yet, check the recent looks of our gorgeous queen. 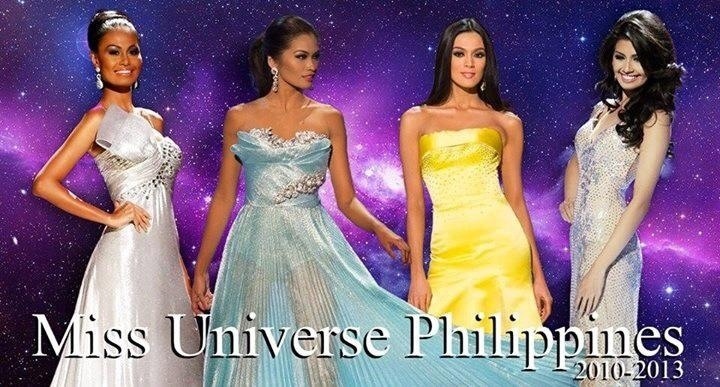 Which do you think is her best and perfect Miss Universe look? Credits to the photo owners grabbed online. 2014 Miss World Philippines Up for a Back to Back Win? The search for the 2014 Miss World Philippines pageant has been extended to September 1, 2014. Our very own Megan Lynne Young clinched the country’s very first Miss World crown on September 28 last year at Bali Nusa Dua Convention Center in Bali, Indonesia. Since the pageant’s initial run in 1951, the Philippines has only one Miss World crown to date. Thanks to you Megan who is to relinquish her crown to the next Miss World Philippines really soon. The question is will this pageant obsessed nation up for a back to back win? How or is it even viable to win back to back given a nexus of mediating factors to winning per playing around probability? Has it ever occurred in the past? If possible or probable, no one would not really know for sure. It is , after all, anyone’s ball game to play and a luck game at that, too. Strongly I believe a competitive and a winnable delegate is as such and would surely make it or if not close to winning. Recently in 2011 Miss World Philippines, statuesque Gwendoline Ruias won Miss World first runner up and Asia and Oceana’s Continental queen. In 2012, gorgeous Queenirich Rehman was among the semifinalists in Miss World. In Miss World pageant’s history as sourced elsewhere online, United Kingdom, Sweden and India are three countries that have won back to back. 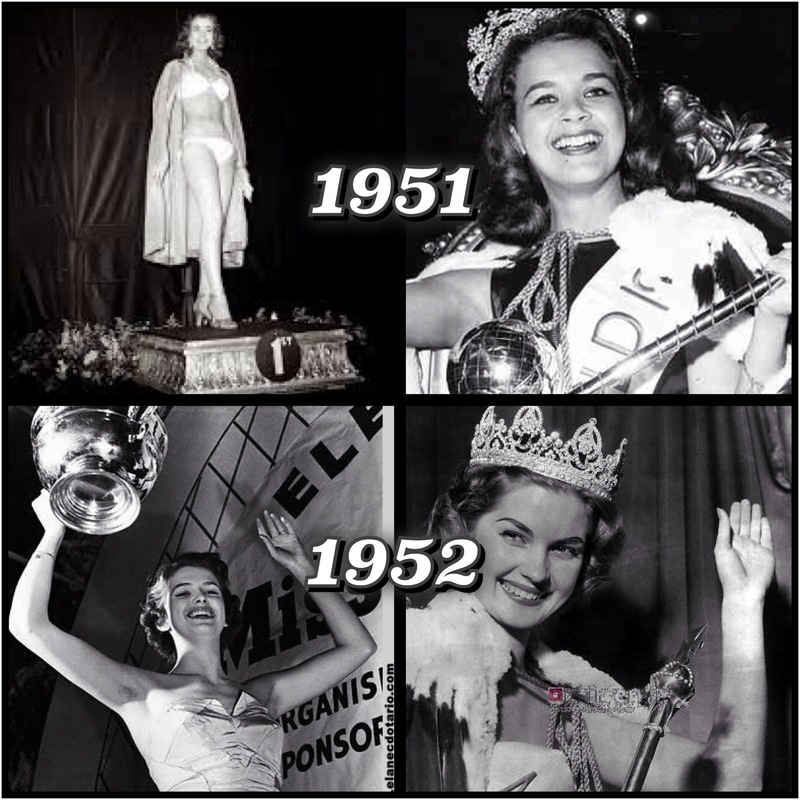 In the pageant’s first two years namely 1951 and 1952, Sweden won with Miss World queens Kiki Håkansson and May-Louise Flodin, respectively. 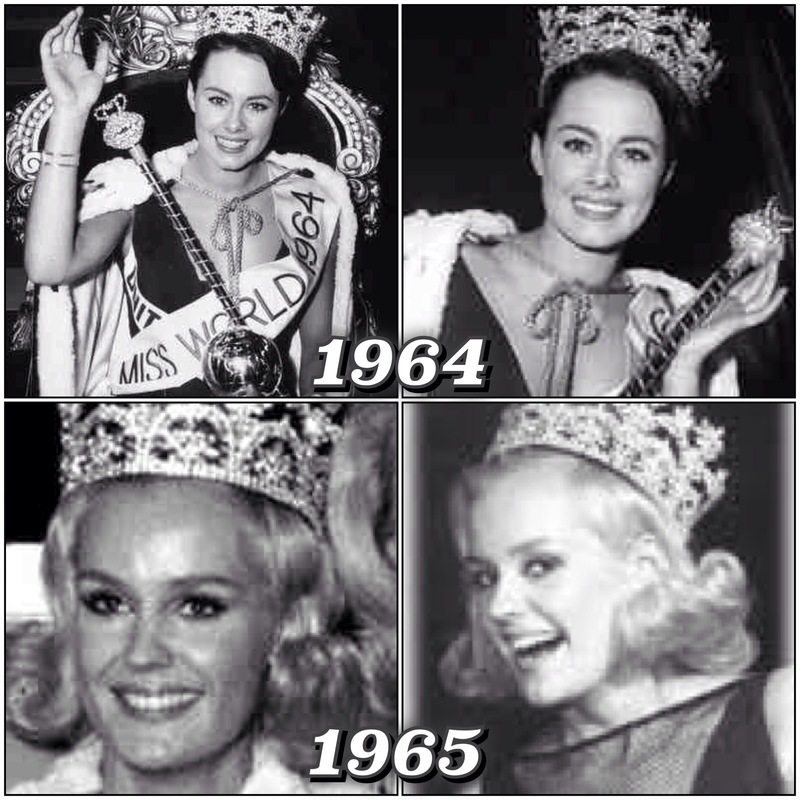 United Kingdom had a back to back win in 1964 by Miss World Ann Sidney and 1965 by Miss World Lesley Langley. Incredible India won consecutive in 1999 with Miss World Yukta Mookhey and 2000 with Miss World Priyanka Chopra. The cumulative effect of constant exposures to beauty pageants over time can more or less make one gauge a certain high level standard of beauty and appeal that would most likely stand out from the so-called bevy of international beauty queens regardless of the pageant’s milieu. Short to state, so long as we send the right i.e., competitive and winnable delegate, one who is classy, smart, gorgeous, very likable to most, very passionate about beauty with a purpose and charity works, etc. this pageant amorous nation shall surely carry on with its good trending in Miss World and yes, why not a back to back win. Credits to the rightful owners of the photos grabbed online. Truly this is the time of the year when pageant enthusiasts get craziest. It’s Bb Pilipinas coronation night happening tonight at the Smart Araneta Coliseum come 8pm. The BBPilipinasGOLD beauties were truly accomplished and successful having won two of four international crowns. 2013 Miss International title was won by Bea Rose Santiago. 2013 Miss Supranational crown was won by Mutya Johanna Datul. Ara Arida placed 3rd runner up in the 2013 Miss Universe pageant while Cindy Miranda placed finalist in the 2013 Miss Tourism Queen international quest. Kudos to the BbPilipinasGOLD beauties for such remarkable wins. You all made us very happy given your accomplishments. Now that this pageant amorous Philippines has kind of come up with the so-called winning formula to making it to the Miss Universe runner up spot year after year given the high placements and recent successes of Venus Raj, 2010 4th RU, Shamcey Supsup, 2011 3rd RU, Janine Tugonon 2012 1st RU and Ara Arida, 2013 3rd RU. Now for sure we are up for the biggest challenge, which is to finally clinch the Miss Universe crown. Recent trend has it that the crowned Miss Universe is someone who has an overall commercial appeal, a pretty good spokesperson, statuesque, has a versatile look, to quite an extent naive and less pageant patty, etc. Given more training, media exposures, better wardrobe, the road to the Philippines’s 3rd Miss Universe crown would seem smooth and thus achievable. Here are my TOP 12. My final prediction basis is the cumulative effect of pageant exposures and a lot of gut-feel. I ranked the ladies by the title I believe would be perfect for them. Good luck to all the candidates of the 51st Bb Pilipinas. May the best ones win tonight! Miss Universe Philippines is THE plum title to be won in Bb Pilipinas. Miss Universe is THE pageant to be won given the many other pageants held in the world annually. In my lifetime I am yet to witness a Filipina crowned Miss Universe. So far we have been doing quite well by the high placement and recent successes of Venus Raj, 2010 Miss Universe 4th RU, Shamcey Supsup, 2011 Miss Universe 3rd RU, Janine Tugonon 2012 Miss Universe 1st RU and Ara Arida, 2013 Miss Universe 3rd RU. Kudos for the four peats as such indeed has placed back this pageant amorous country in the real pageant limelight. I say we must carry on and finally clinch the Miss Universe crown. What can be done aside from attributing winning to sheer luck? To start with, let me define what an Excellent Miss Universe Philippines is by the 8 descriptive items below based on my many observations, (deep-dive) analyses, quite a number of exposures to Miss Universe materials (audio, video, etc) overtime, as an enthusiast, thoughts shared by some of my pageant loving peers, etc. We have been celebrating how this pageant amorous Philippines has “conquered the universe” by her FOUR-peat recent successes to already won 2 Miss Universe crowns. As such, it is tantamount to saying that we have “learned” our hard lessons from the many years of drought being so ignored in Miss Universe, that we have somehow created a success formula and thus applied such so called magical steps into (almost) winning. While it’s said by many in this pageant world that they who triumph are the luckiest of the night, there are also those factors that can be worked on by the candidate or the pageant directors to further boost chances in making it to the cut, to shine further, outwit or to even win it all. 1. She has to be very physically appealing, that is, in the first five seconds you see her you’re glued instantaneously and would say this woman is IT, she is shining like a diamond and a real WOW! No compromises on this and definably no explanation needed of explaining her beauty and background. She has to be the winning package that appeals to most people. The Miss Universe pageant usually has over 70 delegates and the chances of exposures would be fleeting. Even the pace of the preliminary competition is too swift and given so her beauty has be felt and appreciated right within those very few seconds. 3. She has to academically fine as such would manifest her consistent discipline, strong drive, hard work and dedication to what she’s doing. In the Philippine culture education is truly essential and that is something parents work hard for to provide to their children. As she is a role model to the youth, parents can sell in the concept of good education can lead to more and better opportunities in life. 4. She has to ooze confidence to be noticed, to draw more attention and leave a very good impression to others. She has to deliver and carry out her tasks confidently and as such make very good impressions about those. 5. She has to be warm, congenial, and not intimidating to people. That is being the ambassadress of goodwill type ready to reach out, commune with people of different walks of life. 6. She has to look every inch a beautiful Filipina. She must be proud of her color and her rich culture in general. Trending has it over time that the real “Pinay” good looks get much more appeal in the international pageant such as Miss Universe as in the cases of Miriam Quiambao, Janine Tugonon, etc. She could by her very self promote the Philippines to the rest of the world. 7. She has to exude the true meaning of fitness and well-being. As an ambassadress, she would propagate all these amongst the young people especially women where they serve as their role models for inspiration and influence to realize full potentials, fulfill their dreams, etc. 8. She is candid, spontaneous and to quite an extent a lovely naïve. Miss Universe after all is not a debate contest or that she has to be very well researched, persuasive at all times or argumentative in nature, etc. She is not expected to know it all but at her early age but has to have a mind of a good natured and mature woman who could decide for herself and understand what is right, just and true. Looking at the 2014 Bb Pilipinas photos, reviewing the many videos elsewhere online, checking the web interviews, studying recent Miss Universe materials everyday, etc, the cumulative effect of all those are the basis for choosing my TOP 12 to date. This list may still change as we draw nearer the biggest day, which is March 30, 2014 at the Smart Areneta. The current Miss Universe from Venezuela Gabriella Isler shall grace the event with artist Emin. There are a number of activities in line with Bb Pilipinas this year and I’m yet to see more of the 40 ladies. It’s 2013 Miss Earth Tonight! This is the day of the when the new Miss Earth will be crowned. Who among the 88 delegates shall take the place of Miss Earth 2012 Tereza Fajksová of Czech Republic? Let us find out later. After over a month long of pageant activities and many a number of preliminary competitions, here are the author’s TOP 15 and top 6 bets. Personally, the author has witnessed the press presentation up close and covered the evening gown competition for Missossology. I say any of these should win TONIGHT! I can’t wait. The 2013 Miss Earth coronation night will be held at Versailles Palace in Alabang, Philippines come Saturday, December 7 and will be aired live in StarWorld. ABS-CBN Philippine TV network will have a delayed telecast come Sunday, December 8 at 10Aam.